When we’re talking about clear braces, what we’re referring to is a series of ceramic brackets and tooth-colored hardware that functions just like traditional braces, but designed with appearance in mind. The arch wire that works to shift teeth is made from alumina compounds that are strong and frosted to be silver or white, allowing it to easily blend in with teeth. The brackets attached to your teeth are completely transparent. The bands around the brackets can be white, allowing for additional blending. Because of their appearance, it’s much more difficult for people to notice that you’re undergoing treatment, especially when looking from farther distances. When taking photos, you don’t have nearly as much to worry about compared to traditional metal braces. 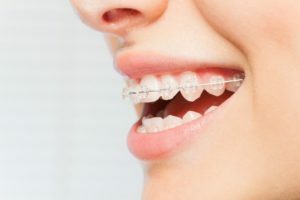 While it is true that clear braces can take longer to shift teeth due to the more fragile materials, they’re still fully capable of fixing issues that clear aligners cannot. If you have crowding teeth, underbites, overbites, gaps or other forms of misalignment, clear braces are an ideal option if you care about your appearance. Some orthodontic systems, like clear aligners, are not intended for everyone. Some people are not willing or able to wear the aligners for the required 20 to 22 hours per day for results. This causes patient compliance to be a direct factor in the success of their treatment. By choosing an orthodontic system that stays fixed to teeth, you don’t need to worry about anything else outside of visiting the orthodontist regularly, using straws to drink staining beverages, and maintaining a proper oral care routine. Don’t settle for crooked teeth just because you want to keep your appearance. Schedule an appointment to get started in your journey to a straighter smile! Dr. Amin Mason offers esthetic orthodontics at his practice to help those with professional careers straighten teeth and look fantastic while they do it. He’s more than happy to help you pick out the hardware that fits your orthodontic needs. To learn more about his practice, you can contact him through his website.